Mamas and Papas Pro-Gro | What Car? 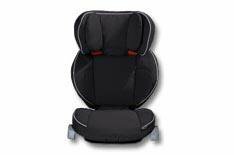 Like the Maxi-Cosi, this seat has a recline function and a novel way to adjust the height of the seat. There are no cupholders or armrests, but the seat is a nice shape that envelopes your child well. You adjust the height of the Pro-Gro with a rotary knob, rather than a pull-action release like on the other group 2/3 seats we've looked at. It works well enough, but pull-action designs seem simple enough to use. The rotary control is also a little slower than a pull action, which is annoying considering the seatbelt guide is tucked away underneath the head support when it's set in the lowest position. Still, the seatbelt router slides open and shut to make it easy to feed it through when the seatbelt guide is exposed. The reclining action also works well. Close to 100 is quite a lot to ask for a group 2/3 seat, even with fancy ways of adjusting the height and recline. Nice fabrics, decent materials and a solid construction make this feel like a seat that's built to last.